It’s officially the giving season at Headlines! That’s because the week was full of opportunities for employees to give back to the university and other organizations that provide assistance to those in need. For instance, Tuesday served as Giving Blueday, an annual effort by faculty, staff, alumni and friends of U-M to support the areas and programs they love. The next day, Headlines offered readers a list of other initiatives that could benefit from generosity during the holidays. 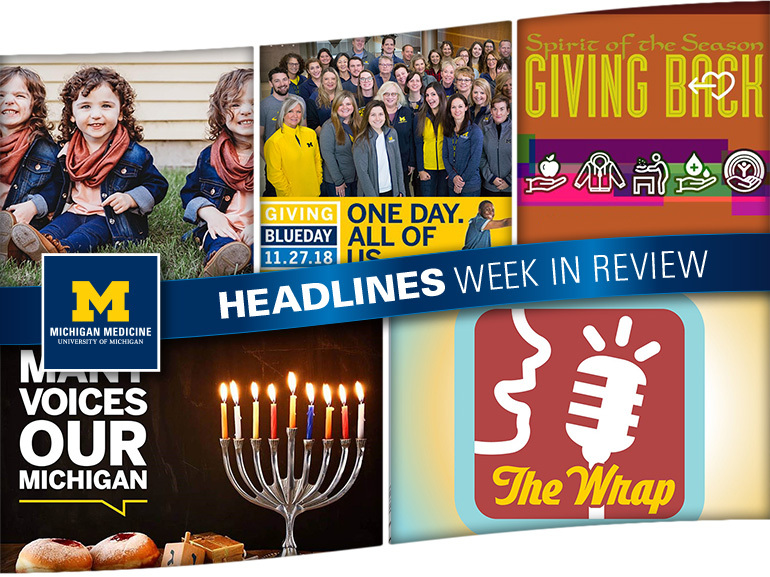 Also this week, the Buursma family shared how experts at Michigan Medicine gave their premature triplets the care they needed to become healthy toddlers, while faculty and staff learned more about Hannukah, the Festival of Lights that gives the Jewish community reason to celebrate. This past Tuesday, employees, families and other supporters were asked to support areas of the organization that mean the most to them. From boosting ongoing research efforts, to assisting the doctors of tomorrow at Michigan Medicine, 12,635 gifts were made on Giving Blueday that raised more than $3.6 million for the university. Learn more about the annual day of generosity! Even though Giving Blueday is over, there’s a lot more employees can do over the next few weeks to get into the holiday spirit. From volunteering to deliver meals through Meals on Wheels to participating in the annual Galens Tag Days fundraiser, click here for a number of opportunities to brighten somebody’s day! From the moment Victoria Buursma found out she was having triplets, Michigan Medicine team members guided her through every step of her high-risk pregnancy. And once her daughters were born, faculty and staff have been instrumental in ensuring they receive the quality care they need. Click through for the Buursma’s story and find out how the siblings are now enjoying life — and each other. Sunday is the first night of Hannukah, the Jewish Festival of Lights that celebrates the rededication of the Temple in Jerusalem. To better support patients, families and colleagues who may be celebrating between Dec. 2 and Dec. 10, check out this story and find out why it has become one of Judaism’s most beloved and joyful holidays.